Phishing and email hacking has become a very real threat to your online security and holiday bookings. To protect your Spain-holiday.com account we introduced a two step verification account log-in in December 2013. This process has now been updated to offer two further methods of accessing your two-step verification entry codes, including via the installation of an APP on your smartphone called Google Authenticator. This new service was launched on 2nd October 2014. Please note you can add as many numbers as you want to your SMS 2-step verification service. Therefore, if you have other family members, friends or a property agent managing your Spain-holiday.com property account, you may also add their mobile number. How to install the Google Authenticator APP? Login to your account of www.spain-holiday.com and click on your name in the upper right corner and choose "security"
Click on "Setup Google Authenticator" and leave the box that appears opened on your screen. You will be asked to scan a barcode onto your phone. If you don’t have a barcode scanner, you’ll need to download one before you can complete the set-up. 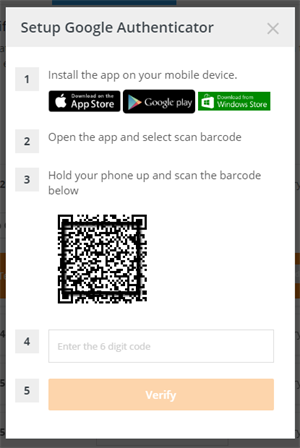 Once you have scanned the barcode, a six digit number will be displayed on your phone, enter this on the page and set-up is complete. If you do not wish to download a barcode scanner, there is an option to set-up the authenticator manually by introducing a long code. You have completed the set up and from now on, you no longer have to rely on the SMS service which can sometimes fail in order to access your account. You will of course continue to receive enquiry alerts via SMS. When you log-in with the Google Authenticator, a six digit code appears on your mobile, which changes every 30 seconds. Input this code into your login page on Spain-holiday.com. It's not essential to setup your Google Authenticator login, but for security reasons, we strongly advise you do so. The other alternative option is 'Verification via Static Codes'. This option allows you to log-in if, for any reason, you are unable to access your mobile phone, or you are travelling, and have your phone switched to roaming. Below your phone numbers in your profile under "security", you will see a series of codes, which you can print out or store as a PDF and keep in a safe place. Each code is valid once. We highly recommend to keep this list with you as a back-up to access your account.